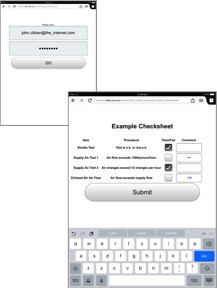 checkIT is a tablet friendly, flexible management system for managing your organisation’s regular checks. The checkIT module is the ideal way to produce quick, consistent checklist reports for yourself and your stakeholders. checkIT makes doing and keeping track of checks as simple and clean as possible so you can simply get on with your day knowing what you need to know. Easy to upload new checks, and totally in users control, checkIT is limited only by your imagination. Completed check records can be automatically forwarded you and your stakeholders at the time of check completion. This improves productivity and removes the need for transposing from paper dockets. This not only improving accuracy it also increases timeliness. Naturally, excel reports can be generated at any time by administrators and downloaded straight to your desktop with support for customer templates to assist with branding and layout needs.